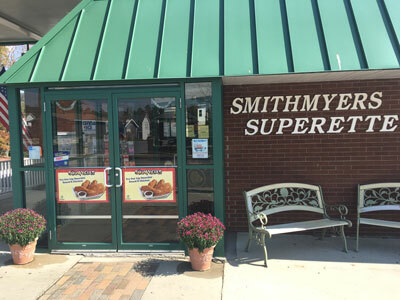 Since its opening in 1965, Smithmyer's Superette in Loretto, Pennsylvania, was owned and managed by the Smithmyer family for more than 50 years. In 2017, when Jay and Louise Smithmyer decided it was time to retire, they wanted to hand off the reins to Jim Gregg and Jess Farabaugh. But there was one small problem. "Because of the successful nature of the store, a portion of the purchase price included goodwill that was hard to finance," said Deborah Krise, Vice President and Business Development Officer at Marion Center Bank, headquartered in Indiana, Pennsylvania. Krise looked to FHLBank Pittsburgh's Banking On Business (BOB) product for assistance. "The BOB funding helped to cover collateral and equity shortfalls in the transaction," said Krise. Smithmyer's Superette is the sole provider of groceries, meats and deli products to Loretto, surrounding communities and Saint Francis University students. It employs nine full-time and full-time equivalent employees, including Frank Wyland, who has been the head of the meat department for more than 40 years. The store provides an opportunity for local citizens to work in a friendly, professional atmosphere. "Jess and I are very proud to be the new owners of Smithmyer's Superette," said Jim Gregg. "This small grocery store has had an excellent reputation, and we couldn't be more excited about continuing its success. Thanks to Marion Center Bank and FHLBank Pittsburgh, we were able to make our dream of one day owning a successful business a reality."